They may have not lifted a single trophy since 1996, but Ruch Chorzów SA (Spółka Akcyjna) remain the club with the most Championship titles won in Poland, and their amazing achievements from the early thirties until the late seventies are more than enough to secure them a spot in Polish football's “Big Five”. The club is commonly referred to Ruch Chorzow FC in English. Ruch in 1936, in the middle of their golden decade. Ruch Chorzów were founded in 1920, turbulent times in eastern Upper Silesia. The name chosen for the newly-formed team was “Klub Sportowy Ruch Wielkie Hajduki”, or so can someone read in Ruch's official website. Other sources use the German sounding “Bismarkhuta” instead of “Wielkie Hajduki”, which is in accordance with the fact that back then the region was heavily disputed between Poland and Germany. Two things all sources agree on, is that “Ruch” is Polish for “Movement”, and “KS Ruch Wielkie Hajduki” is how the team were known as in the thirties, when they dominated the football scene in Poland. Their first Championship title in 1933 was followed by three more consecutive ones, while after a short break in 1937 they returned to the top in 1938, and most probably they would have won the 1939 Championship as well, if the season had not been cut short due to World War II. Ernest Wilimowski, Teodor Peterek, Edmund Giemsa, these are the three names mostly associated with that unrepeatable decade in Ruch's history. The first two were the league's top scorers almost without exception from 1934 to 1939, with Giemsa being equally instrumental in the team's successes, despite the fact that he scored considerably less than Wilimowski and Peterek. After World War II, it didn't take Ruch too long to – almost – replicate their thirties' dominance. 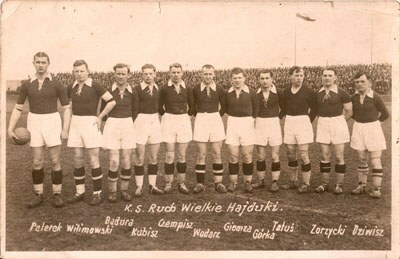 In 1951 they won their first Polish Cup, and for some reason were awarded with the Championship title as well, even though that season they finished only sixth in the league. Either way, 1952 and 1953 were all Ruch, with the Chorzów club already counting eight Championship trophies. Gerard Cieślik was their main man to watch those days, winning the title of the league's top scorer both in 1952 and 1953. The sixties brought two more Championship titles to Ruch, and in the seventies the time was ripe to make their name heard at international level. In 1973 they finished second, and earned the right to represent Poland in next season's UEFA Cup. After eliminating West Germany's Wuppertaler SV, East Germany's FC Carl Zeiss Jena, and Hungary's Budapest Honvéd FC, they reached the quarterfinals. There, they fell to Feyenoord, with the Dutch side going on that season to win the trophy. Same time Feyenoord were celebrating their UEFA Cup triumph, Ruch were lifting two trophies themselves. Eleventh Championship, second Polish Cup, and excellent presence in Europe, Ruch's best season ever, which was almost matched next year, when the Chorzów club won their 12th Championship, reaching once again the quarterfinals of a UEFA competition, this time the European Cup, today's Champions League. Before the seventies were over, Ruch had won another Championship, in 1979, the cherry on top of a great decade for them. Ten years later, Ruch celebrated their 14th league title, with Krzysztof Warzycha scoring 24 times to top the scorers' charts. What made that title even more remarkable, was that Ruch won it right after returning to the top league, having spent the 1987-88 season in the second division, after their first ever relegation in spring 1987. Ruch's team in 1989, the one that won the club's last Championship title. In 1995 they got relegated again, but amazingly managed to win a third Polish Cup in 1996, even though they were playing in the second category. Ever since then, Ruch have spent more years in the second division, failing to add more silverware to their collection, even though in 2012 they came very close, finishing second in the Championship, and reaching (but losing) the Cup final. A big “R” is what stands out in Ruch Chorzów's crest. The initials “KS” on the left, stand for “Klub Sportowy”, “Sporting Club”, and they have been kept in the logo for historical reasons, even though they stopped forming part of the official club name in 2005. Blue and white are colours associated with Silesia, the part of Poland that Ruch call home.